This week's Mid Week Match-Up is for DT regular Fleetwood T. Brougham who writes from the Nashville, TN area with the following request:. I’m looking for a beater work truck, the kind that lives in the far corners of my driveway, never sees the inside of a garage, and is used for hauling mulch, limbs (the arboreal kind, not human), runs to the dump, and kayaks. 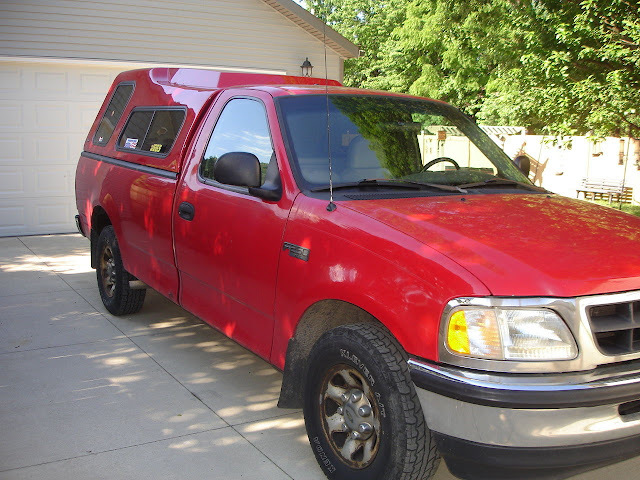 -Would ideally like a full size truck…..Something like a Ranger just won’t cut it. -Ideally would like an extended cab or larger, but if it oozes character, I’ll make the kids pile together in a single cab. -I like old stuff, but when it comes to trucks, nothing older than that mid to late 60’s. -Please….I beg you, limited to no rust. I hate rust. Other than that, it’s wide open, 2wd/4wd, auto/manual, pretty paint/ugly primer, I really don’t care. I suggest this 1997 Ford F-250 with camper shell here on eBay bidding for $1000 with 4 days to go, located in Cleveland, OH. OK, for the serious answer, I present an assortment of beater Dodge Ram extended cab models. Check them all out in person and pick whichever one's in the best shape. Oops, I meant to call that the "Common sense and practicality are SOOOO overrated" option. And this should be the correct link for Ram #2 - it's also the lowest priced one of the lot, so I didn't want to leave it out. I vote yes to the dump truck, lots of limbs/mulch hauling capacity. Please let us know what you end up with. Matt, I know I should like the Dodges, but any product from the Daimler/Chrysler era scares the hell out of me.......just an unfair bias I have. Now if you see a sweet 80's era Power Wagon, game on. May not be a pickup truck, but oooozes character!!! Don't be a lemming(lifted, coal rolling, aftermarket bumper, etc)stock is cool in this case. -check! 2wd..slippery trail to launch kayak a problem?? ?- maybe. If map locator correct, only 15 miles from me if truly interested. Tho..listed on different Craig city???? Hmmm??? Wow....that's a helluva find actually. There's only one real problem with it....it's almost TOO nice to use as I intend to. Pcar928gt -- that is a sweeeet deal. Gonna put that up on the front page tomorrow. I have to admit, the wooden armrest IS oddly tempting. Thanks for putting this up Vince, and for all the great suggestions so far. This is my favorite part of DT. Getting people to open up and explain their car needs to the public and watching the commentariat make incredible, terrible, insightful, and enthusiastic responses. I'm not sure if anyone has ever purchased a car recommended in the MWMU, but I know several who've purchased similar cars based on the suggestions from all you guys/gals out there. Hola amigos......thought I'd give the rare MWMU follow-up. Appreciate all the great suggestions, but I ended up going with a local 1987 Chevrolet longbed 2wd pickup. 130k miles, limited rust, no A/C, a rattle can white paint job, cut-off muffler, character galore, and a shade over $1000. Runs like a top and my Audi Q7 daily driver hasn't moved from its parking spot in my garage since I got it.